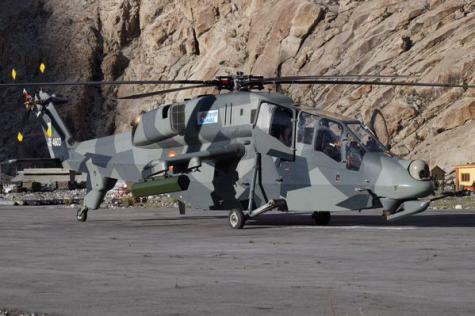 BENGALURU, India --- The hot and high-altitude trials of indigenously designed and developed attack chopper Light Combat Helicopter (LCH) has been successfully carried out at Leh recently, Hindustan Aeronautics Limited said on Thursday. The seasonal trials - including cold weather trials carried out at Leh during February this year - have been completed as part of the certification process, HAL said. The flight trials at Leh have established hover performance and low speed handling characteristics of the helicopter under extreme weather conditions at different altitudes (3,200 to 4,800m). During the trials, the helicopter and systems performed satisfactorily, HAL said in a release here. LCH also has proven its capability to land and take off at Forward Landing Base in Siachen. "LCH is the first attack helicopter to land in Forward Bases at Siachen," HAL chairman and managing director Suvarna Raju said. Further development activities are under progress and the weapon firing trials are planned for mid-2016, it said.